30 Days of Leaves (Day 2)! 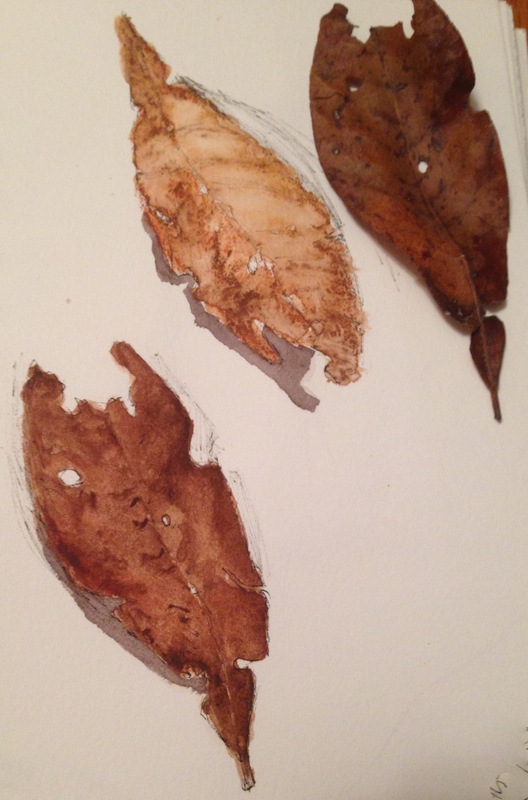 I am loving studying and drawing/painting fall leaves. I can’t wait for the amazing rich colors; it’ll make this challenge that much more fun! I want to thank BB for issuing this challenge! I almost didn’t post this one, because in both cases, my initial ink sketches were a bit wonky and couldn’t be erased. But I decided to go ahead! Having a great time with this! Once again, the top painting is ink and Neocolor II crayons, and the bottom is ink and my travel Cotman watercolor palette followed by another layer with my traditional (mostly M. Graham) watercolor palette. Such rich, juicy colors in the M. Graham spectrum! Karen at Lincs in Stitches is joining in as well, and I’m so inspired by her paintings AND fabric creations. Wow, so much talent here at WordPress! Speaking of talent, I haven’t forgot about the September Draw A Bird Day recap – I hope to compile that list and post it tomorrow. I wish you all a wonderful almost-Autumn Thursday. Can’t wait for those red maple leaves! Peace. Beautiful leaves Laura. Love the texture and color blending…gives them depth. Thank you! They are so wonderful to study and capture. I thought flowers were great, but leaves are even better (surprisingly)! Great job Laura! These are so wonderful already, I can’t even imagine what they are going to look like after 30 days! Hasn’t the weather been amazing! This is about the most perfect weather week ever here. Cool mornings and evenings and sunny warm afternoons with no humidity! GLORIOUS! Happy Day! You sure are living proof! Peace my Fall-lovin’ friend! It just gets better and you only have painted leaves for 2 days. Love it! Thank you so much! I’m really enjoying it. Who knew?? I thought flowers would be the pinnacle. Flowers are much more difficult to capture, it seems. These are beautiful Laura. maybe botanical art is your forte? Thank you, Denis. I’ve been wondering about leaves in particular……my florals have improved, but I still find them tough! Leaves seem to come to me naturally now, which blows me away. Last year I tried them and almost threw in the towel with drawing completely. Interesting what a difference a year makes. Thanks for your encouragement! Well…you must be doing a great job because at first glance I thought these were real leaves you had glued onto a page. Thanks, Kathy! I really appreciate that! I keep thinking “which is real and which is Memorex” every time I take photos of these leaf paintings. I can hear the crunch when the leaves crumble underfoot. Nicely rendered Laura. I can tell you are having fun! Have a happy day. Thank you so much, Sharon! I am loving this challenge!! Who knew??? I thought it would be insanely difficult, and just figured “here goes nothing” but I guess my lifelong love of leaves is paying off. Wonderful, I’m thrilled about that! Her work is amazing! Thank you so much!! I’m learning to do that. What a great piece of art wisdom that is. Thank you, Kerfe! I don’t see any wonkieness here. 😊I really love the shadows! They really make the leaf pop off the page! Very nice I can feel every bump. Wonky is good …nature is wonky. If you press a leaf it will be flat like you ironed it. However, you will be able to capture the color of any leaf at a particular time. Really enjoying your leaves. Thank you, Carmel! Will you be doing any leaves this fall? I can’t believe how much fun this challenge is! I saw some red leaves starting to come up on a tree this morning. Good job, Laura. Have a great day! Nice job! I like this leaf project very much. Thanks, Kirk! Will you be trying some leaves? Perhaps. I love to see them as well. Jill, I will never forget this year, even with my horrible memory! And so many sketches of Penny in there too. This is so precious right now. Thank you. Too funny…we both used the word “wonky” in our posts today…and I didn’t even read yours before I posted mine. 😀 I just love those leaves you’re doing…like Jill said, they look real! Thanks, Teresa! Much like your ceramic plates! Off to visit your wonky post lol! These are terrific! I feel so much better having read that you “almost threw in the towel” last year painting leaves……I thought I was going to find this challenge easy but I must admit I am struggling with painting. Hopefully I will have mastered the subject by the end of the thirty days. P.S. Loved the “wonky flag” comment from Doddlewash! PS I think your paintings look great, Karen! Press on! Thanks, Rebecca! I am so in love with neocolor! They are incredible tools. I’m so glad you like my leaves. I’m enjoying them soooo much! You’re so right! I know what you mean exactly. I am so careful about what I buy – you should have seen my process last year with trying to choose a set of CPs. I fell in love with the Pablo line – I’m pretty sure that’s Caran d’Ache, but they were so expensive. I recently learned they have Supracolor which is watercolor pencil that is supposed to be wonderful and a rep. is going to send me samples of that and also the Neocolor I, which is water-resistant. I just have a sneaky feeling that I will fall in love with everything by Caran d’Ache, just as I love everything I try by Faber-Castell. I love Derwent products too! I am so hooked on art supplies, but you have to be so careful, because everything is sooo pricey. I don’t blame you at all for buying a couple of them open stock – I only bought one and really liked it, but the color I chose was so pale that it didn’t give me a chance to see how vibrant the color really was. Love fall weather very nice glad you decided to post this! Thanks! I’m having the best time with this leaf project. Laura, I’m so glad you still posted this! I love it! My favorite part is taking all the creations and putting them together. They become a special collection and ones you thought you didn’t like… well, they seem to compliment the set perfectly. Beautiful work! Thank you!! I think you’re really wise to be painting yours on tiles. I’ve been doing them in my art journal. Now I’m wondering if I should be trying some on good watercolor paper, as I’m thinking of opening an Etsy shop soon (before the Christmas shopping season). Would be nice to have the option to sell some of them. Maybe I should wait for the more rich colors for that. Although – I tried one last night that was orangish and yellow and didn’t even get past the Neo II crayons sketch, as I really couldn’t capture the richness. I think I’ll need the cadmium hues for these leaves. Are those the colors you usually use in WC? ooh, that’d be so cool. Thank you! I haven’t had much luck with Strathmore watercolor paper, but haven’t tried those tiles. Sounds like you’re happy with them? Thank you, Ann! I hope I can keep the momentum going when I start making the color shift! I like all the leaf paintings that you are working on. This one caught my eye, especially. Maybe because it looks like it has gone through a lot. So fragile. Beautiful! Thank you Leslie! I’m enjoying the mix of subject and medium.